When Assistant Private Investigator Cate Kinkaid gets a frantic call about a triple homicide, Cate goes to the scene of the crime against her better judgment. After all Belmont Investigations doesn’t do murders. Only, the victims aren’t what she expected. Now she has a new rule and three shot dolls and no way of knowing why someone would shoot this nice lady’s dolls. Just when Cate is ready to leave this to the police she finds another victim, this time an actual person. Cate wants to leave it in the hands of the police but her client and her PI instincts get in the way of her letting this one go. So she goes on the hunt for the killer and with an endless amount of suspects, she knows it isn’t going to be easy to track down the killer or his weapon. As Cate narrows down her suspects and tries to solve this crime, she finds she always ends up at the scene of a crime. But when she and the killer have an altercation, Cate knows she doesn’t have long before he either recognizes her or she recognizes him and she needs to nail him before then. Join Cate on another adventure as she tries to solve yet another murder with her deaf cat and all the hilarious hi jinx that come along with her. Can Cate manage to catch another killer or will this one grab her before she grabs him? Will Cate’s client end up being the killer or will she find out who really did it in time? Can Cate manage to not get kidnapped like last time or will she yet again be nabbed and held hostage? Will Mitch have to come to the rescue again or will Cate be able to catch a killer by herself? I thoroughly enjoyed the first book in this series and was excited to get the chance to read the second book in this hilarious mystery series. And I must say that the hi jinx and clumsy encounters just get even funnier. This book made me week and was easy to get hooked on. Though, for me it was a bit too easy to figure out the killer, I still enjoyed watching Cate try and figure out just who did what. This book is a mixture of humor and mystery with a dash of romance and I loved every minute of it. As far as romance goes, this book is a follow-up on the first and made up for the lack of romance in the first with showing the reader their little quirks and interactions as a couple in this one. It allowed me to really see them become close emotionally. Also, the added humor in this book not only lightened it up when it needed to but also added a bit of character to the story and characters, making this story memorable. The murder mystery was interesting. Though I figured out the killer about halfway through the book, with such a wide array of characters as suspects, I spent most of that time trying to figure out if my guess really did do it. I liked that. It made me feel like I was just starting out again. I also loved how the story played out and the motive behind the killings. It gave the story a whole new air of mystery to it. The thing I loved most about this book, though, was Cate. She’s clumsy, sometimes naive, and she always manages to get herself in sticky situations but that’s what makes her so lovable. I love watching her become an even better PI as the series goes along and I love the fact that she always uses Mitch as a bodyguard/tech geek, because I would too. Her character is fallible, literally, yet sound in her beliefs and I love her. She’s the real reason I pick up these books. The author captured my attention with her mysteries in the first book in this series, but she really grabbed me in this one. I can see why she’s award winning and is a best selling author. I look forward to reading more in this series and seeing how many books there will be. I can’t wait to see what other adventures I will go on with this author. This author, series, and book come highly recommended. Overall, I loved this one. It’s the perfect mixture of humor, mystery, and romance. I recommend this book to people who like a good mystery with a comical twist. I think this book is perfect for teens, adults, and Tweens with adult supervision. I give this book a four and a half out of five. Cate Kinkaid’s life is well, floundering. Her social life, career, and haircut are all a mess. When she becomes unemployed, she jumps at the chance to work for her PI uncle, just until she can find a “real” job. With no experience, she begins to realize that investigative work is a little bit harder than she realized and she can’t wait to find a job she actually knows how to do. Her first assignment is simple, determine whether a particular woman lives at a particular address. When she reaches the old, dark Victorian mansion, she’s greeted by an angry horde of gray-haired mystery readers and a dead body that held all the answers. Now her “simple” PI job is turning into a nightmare. Her uncle assured her that there was no excitement and nothing like the television, but with this job, Cate doesn’t really believe him. Now Cate must traverse a boatload of suspects, finding her client, and trying to figure out the murder. Also, add the fact that there is a handsome man who wants to be in her life and Cate feels like a kite with no string. Care feels lost and out of control not to mention, she has no idea what she’s doing. How is Cate going to solve a murder when she can’t even find her client? Is she going to be able to solve the murder or will she die not knowing who is the murderer? Will she open up her heart to love or will she let past experiences close her heart? Will Cate continue her search for a “real” job or will she find that enjoys being a PI? This book surprised me in many ways. I didn’t expect to enjoy this book quite as much as I did, nor did I expect to not guess the killer. Thankfully, I was surprised on both accounts and I ended up enjoying the beginning and ending and every part in between. Lorena McCourtney was able to capture my attention and keep me interested until the very end. However, there did seem to be a lot of characters, and by a lot I mean too much. It was character after character that was on the edge of being hard to remember who was who. Not too mention, that almost every character was a suspect, which was great for throwing people off the scent of the murderer, but horrible for a manageable number of characters. Another thing that I didn’t like, was the senseless romance. Her love interest came in handy for rescues and Internet searches, but other than that, the romance seemed pretty pointless. However, I do like how the author handled it. She tried to make the romance realistic and in the background, which I appreciate, and I look forward to seeing their relationship progress as the books continue, but I’m still not totally sure that it was a necessary part to add to the book. The one thing that I really liked about this book was the fact that Cate had no idea what she is doing and only knows what she’s seen on TV, which isn’t much. It added some comedy to the book to see her inexperience, not to mention, some of the situations she gets into trying to find and help her client. 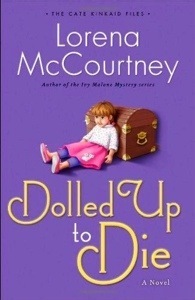 Lorena McCourtney’s book isn’t perfect, but it is an enjoyable read that’ll keep you hooked until the very last page. I definitely look forward to reading more from this author and I will definitely read every book in this series that I can get my hands on. This book got me hooked and I can’t wait to see what trouble Cate’s going to get into next. Overall, this book is a great read but expect a lot of characters. I recommend this to anyone looking for a mystery that’s difficult to solve or anyone who just wants a good mystery. I give it’s book a three out of five.